The following guide provides research strategies and sources to help you with your CMNS 253 literature review assignment. If you do not find what you need, please Ask a Librarian or contact Sylvia Roberts, Liaison Librarian for Communication (see the box at right for details). My work week is split between SFU Vancouver and SFU Burnaby so the best way to reach me is by email. If necessary, we can make an appointment to consult in real time, by phone or in person. NOTE: The information in the grey boxes below is taken directly from the assignments. The yellow boxes show examples. 1. Write a literature review, being sure to cite at least three academic sources. Use the sources suggested below to find these articles. 2. Write a short esssay based on your literature review. Include an opening paragraph that explains the technologies you chose and your reasons for choosing them (presumably they are the ones from your second assignment). End with a concluding paragraph in which you speculate on what further research you could do on the topic and how you would do it. Your essay whould be 750 to 1,000 words in length, using APA citation style. 3. Submit both components to your tutor-marker for marking via the Assignments dropbox. This assignment brings you another step closer to an actual research project. In this assignment we ask that you locate scholarly research related to the phenomenon and technologies you used in your second asssignment (e.g., texting while watching television). Your objective is to (1) write a short lliterature review summarizing what the research tells us is already known about the topic and (2) summarize your findings in a short essay. See Perez-Latre's (2011) paper on social media for an example of a literature review. A literature review helps you discover scholarly research that pertains to your topic. Conducting a review or survey of previously published research on your topic will provide you with information as to what research has been done, types of questions asked, methodologies used, subjects studied, findings, theoretical approaches, etc. This is useful both as a way to gain background information about your own and related topics, and to identify gaps in the research that lead you to good research questions for additional studies. Search one or more of the following indexes (also called databases) to identify suitable articles in a variety of academic journals. Each index contain records that describe articles in a range of journals, usually within a specific discipline such as Communication or Computing Science. Some indexes also include conference proceedings, book reviews, newspapers, primary sources, etc. Many indexes contain full text for articles, either in PDF or HTML format. Full text for other articles can be found by following the Get@SFU link in the search results list or in the full record. NOTE: Computers are a literal technology. Though you & I understand that "text messaging" and "text messages" are conceptually related, online search systems will find matches ONLY for the exact term that you use to search. For example, search Communication & Mass Media Complete for "text messaging and teenagers". When you view the records in your search results, you will see your search term bolded. The default order of the records in the results list is by relevance. You can change this to get the newest records first. If you do not get adequate results, try using synonyms or related concepts as additional search terms, using OR between related search terms. to find records that have any of the search terms in the first box, as well as one of the search terms in the second search box. In the left side-bar, you can see ways to focus your search. The Subject: Thesaurus Term limiters let you choose from a list of official subject terminology that occur most frequently in your search results and assigned to all relevant records in the database. The most relevant looking records in the above results contain the subject terms Text messages (Telephone systems) and Teenagers. To find all relevant records in the database, use these subject terms to search, including those with that phrase in the abstract or title, or in the subject terms, use this as a search term. To tightly focus your search results, indicate that you want the database to search only in the subject term field for these subject terms, as in the example below. The subject term search finds all records in the database with a major focus on that topic. When you find a relevant record in your results, scan it for leads that you can use to improve your search strategy. For example, if you search for the terms used as subject headings, you will identify all records in that database that focus on that specific topic. As well as searching for articles by topic, you can use an author's name to find other research they have done. Often academic researchers work on related research questions over the course of their career. If you don't find anything on your specific new medium (because it's too new or because no one has done the research), consider research about media that shares characteristics with your focus. You may find relevant records if you search for "students" as well as teenagers. To ensure you are using credible, high quality resources, you need to evaluate the content of the information and credentials of the author. The article will cite sources consulted as part of the research. You will find in-text references and a bibliography or reference list included with the article. This enables the reader to position this specific research in what's known about this topic. The language of the article will be scholarly, will identify the research methodologies or methodological frameworks employed. For detailed information on how to recognize an academic journal article, see the Library guide What is a Scholarly Journal? You can determine whether a journal is an academic journal by checking whether or not the journal is peer-reviewed. A journal will often disclose whether it is a peer-reviewed journal on its "About" page. If you use an online journal repository or database, such as the ones provided by the SFU library, you can check whether a journal is peer-reviewed by finding summary information about the journal. Use Ulrich's Periodicals Directory / ulrichsweb.ca. 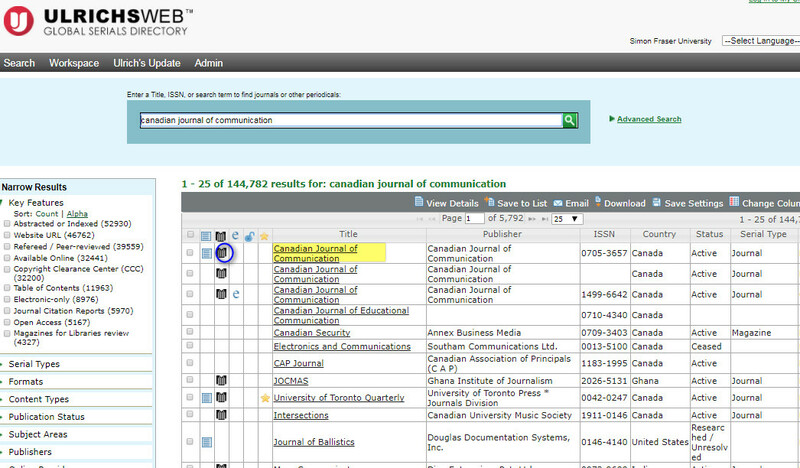 Search for the journal title and look for the referee's jersey icon (see screen shot below). "Refereed" is another way of saying that a journal is peer-reviewed, that is, reviewed by experts in the discipline, to assure the articles are of a high standard and contribute significantly to scholarship in that field. As well as discussions of research undertaken by scholars, you can find a policy paper or research undertaken by government bodies, whether at the regional, national or international level. Factual sources can include statistical reports, information published by industry or trade associations and news articles, as well as scholarly sources. Write a short essay based on your literature review....Your essay should be 750 to 1,000 words in length, using APA citation style. The SFU Library guide to citing APA style provides information and examples of how to cite your sources in APA style. If you have questions about how to cite your sources properly, please Ask a Librarian.